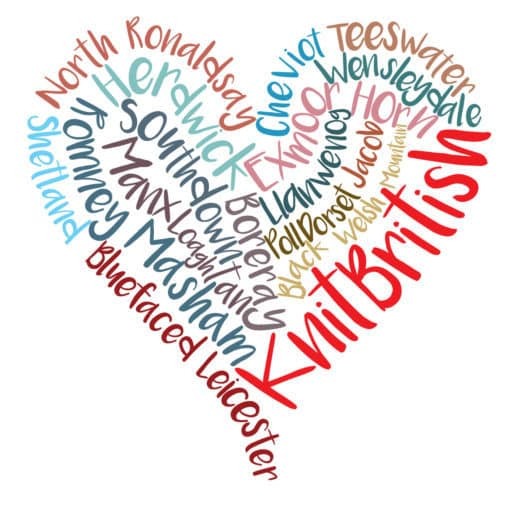 A few weeks ago, Teri and Becca from Ewe and Ply got in touch to see if the KnitBritish Woolly Muckers might like to give their new yarn a go! Ewe and Ply is a shop in Shrewsbury Market Hall and British wool and brands are really important to them. When they told me the fibre content of their new custom spun wool, I couldn’t wait to hear more! It is 34% Welsh mule; 28% Shropshire; 20% Sherino (Shetland x merino) and 18% Bluefaced Leicester. “In Spring 2017 we collected 130 kilos of pedigree Shropshire fleeces, starting with Teri’s 21 pedigree sheep and moving around the local area, gathering fleeces. We collected fleeces from locally bred BFL sheep and fleeces from a rather special flock of Sherino (a Shetland merino cross) sheep from Gloucestershire. All these fleeces were sorted through, picked over and graded by the two of us. Back breaking work done in the beautiful but fierce sunshine of last summer. To bring up our total weight of fleece, we sieved through and selected Welsh mule fleeces from our local British Wool Board depot. We have touched every single fleece that went into our new spin to ensure the best of British quality. With the yarn created, the next stage was dyeing and Teri and Becca used natural dyes to create a palette inspired by hedgerows and countryside. When the review skeins tumbled out of the packing bag, I can safely say “achievement unlocked”! The three reviewers drawn from random from our Woolly Muckers Review thread, in the ravelry group were Katherine (aka katsmoke), Alice (aka maplethedog) and Meghan (aka halcyonday) and they have reviewed this yarn with real wool exploration gusto! 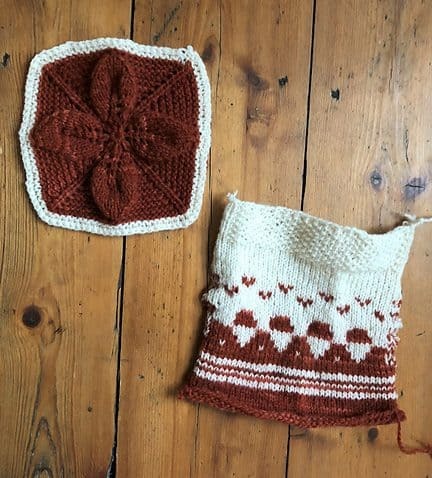 Meghan also crocheted a swatch in her second mini, but has misplaced it in house-move chaos – I can relate. I am sure if you check back to her Ravelry then she will have images of this soon. Fibre Content: 34% Welsh mule; 28% Shropshire; 20% Sherino (Shetland x merino) and 18% Bluefaced Leicester. In the skein, this yarn had a lovely sheep-y scent and appeared bouncy and warm. It definitely looked woollen spun to me and seemed to be calling out for a bit of colour-work! The hand-squish-grab is extremely plump and lofty—this yarn traps a lot of air, so there’s loads of squish to be had. It isn’t quite crisp but not outwardly soft either, and it feels heavy in your hands. I received two colours, one natural cream and one lovely slate blue. This yarn had a nice crisp hand to it when the squishing began. I hand wound the skein and did have to stop frequently to unstick the yarn from itself, so it definitely felt sticky and robust. Very even twist with some longer guard hairs showing. Swatch #1: I cast on 40 stitches on a US 5/3.75 mm needle and joined to see how the yarn knit up in stockinette and simple colour-work. 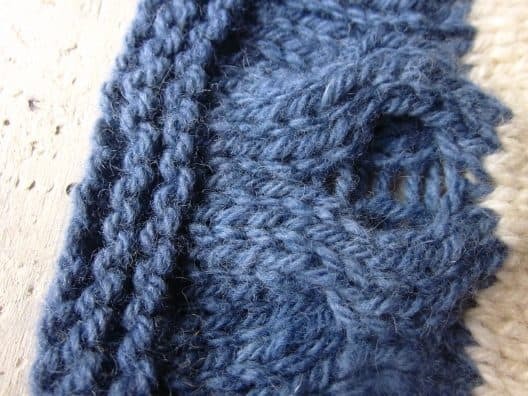 The yarn felt robust and plump in hand – the dyed skein, in particular, seemed on the plumper side of DK and almost reminded me of knitting with an American worsted weight yarn. Knitting with the yarn was like meeting up with an old friend … I easily felt into a comfortable rhythm with it. The yarn glided easily off my metal needles without being slippy, and there was no splitting. I didn’t observe any vegetable matter in the yarn, though occasionally came across single longer hairs which could easily be pulled out. I enjoyed working the yarn up into a simple colour-work pattern and noticed that, in the colour-work, the un-dyed yarn did seem ever so slightly thinner to knit with – I wasn’t surprised at this as I’ve knit with other yarns before where different colourways seem to be a slightly different thickness. 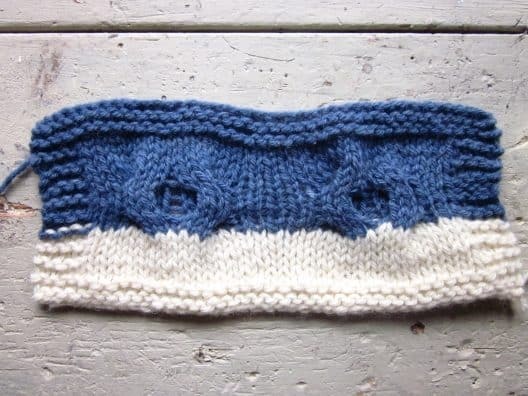 I finished off the swatch by knitting a short section in seed stitch, and found the yarn took simple texture just as well as it had colour-work. I was happy both with the way the yarn handled colour-work – there’s definitely a “sticky” factor that meant that even unblocked, you could tell the two different coloured yarns were happily grabbing onto one another in the colour-work (I hope that makes sense!) I loved the subtle colour variations The gauge of my pre-blocked swatch similarly suggested a slight difference in the two: in the stockinette portion of the dyed section, my gauge was 19.5 stitches over four inches, in the undyed section, it measured 21 stitches over four inches, and in colour-work, 22 ¼ stitches over four inches. Swatch #2: Since I had plenty of yarn left, I decided to see how the yarn would do with some very simple lace and texture, and used a US 4/3.5 mm to cast on for a Birlinn square by Kate Davies. Again, the knitting was easy … no splitting of the yarn when working decreases and the pattern worked up a treat! The petals of the Birlinn pattern were nicely defined, and again I loved the subtle variations in the naturally-dyed colour over the garter portions. The yarn overs didn’t come out particularly prominently – it probably wouldn’t have hurt to do the square on a US 5. Pre-blocking the square measured 6.5 inches. I cast on 40 stitches on 5mm needles, which knitted up to a dense, heavy fabric with a lot of structure and very little drape. 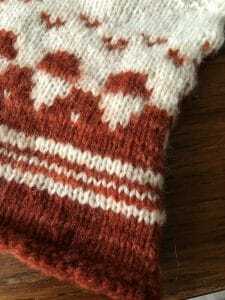 While knitting the yarn felt smooth but not soft, and had very little elasticity. It sat firmly on my wooden needles with no slipping, and I don’t know if I could have split it if I tried, as the plies were very dense. The yarn felt very dry while knitting. The stockinette was smooth and regular and the garter stitch was plump and squishy. There were very occasional guard hairs that pulled out easily. Cast on with 4mm needles. Stickiness very handy when it came to cabling on my swatch – I prefer to cable without a cable needle as much as I can and this yarn allow me to do an eight stitch cable without worrying at all, the four transfer stitches just sat there and waited for me to pick them up again. Excellent stitch definition in both the cables and the lace in my swatch and it was very easy to read my previous rows in the lace. The moss stitch border was plump and perky! Finished swatch was 8 inches by 5 inches and I did the first block in lukewarm water with some Soak in it for 20 minutes. No rinse required and no dye leakage. Square blocked out to 9 by 6 and stitch definition remained crisp, guard hairs softened. I soaked both swatches for over two hours in lukewarm water with a bit of Eucalan. The water was very nearly clear when they came out … no dye bled out and very little lanolin from the wool. The block nicely relaxed the fabric. My colour-work swatch, in particular, had had some wonky bits where I’d been stranding while using magic loop, and I was surprised to see even those were gone after a nice block. For the colour-work swatch, my gauge relaxed just a tiny bit after swatching: in the dyed shade, 19 st/4 in, in the white, 20.5 st/4 in, and in colour-work 22 st/4 inches. I pinned out my Birlinn square to 7 and ¼ inch, which it stretched to easily, and it kept it’s dimension when I unpinned it. I spent a day and then some wearing both the swatches. I wore one tucked into my waistband, and this one I forgot about almost immediately. I put the second one on my chest, tucked into my bra strap and did feel some prickles for the first few hours I wore it, and found myself occasionally scratching at, etc. The longer I wore it, however, the more I got used to it and by the end of the day I barely noticed it – though I did notice the lack of warmth when I finally removed it. Soaked in warmish water with a drop of Dr. Bronner’s soap for a few hours, then rinsed in cool water (this is my normal blocking/washing routine for my woollens). The yarn bloomed a lot and became drapier after blocking. The stitches opened up beautifully and the swatch, which had felt very dense before blocking, became much more open. It also got much softer. I wore it at my waistband on a doing-things-around-the-house sort of day. I was aware of it against my skin, but it felt soft and warm. I think I mostly noticed it because it was such a thick swatch, especially with the cables, and was a bit bunchy under my summer clothes here in the New Mexico heat. I didn’t get even a hint of prickle, though, and I can be quite sensitive on my soft underbelly! Wearing the swatches I had a similar experience as my first wear test … in more sensitive areas around my chest/armpit I noticed a slight prickle which soon resolved itself. At my waistband and on my back, I forgot about the swatch almost as soon as I put it there! I vigorously rubbed and distressed both swatches with no pills appearing. The rubbing brought up some of the single hairs that I had observed in swatching. Further very vigorous rubbing on my colour-work swatch (which was knit with larger needles) brought up a pill or two – but it took a fair amount of effort. I think this yarn would be very hard wearing … it took a lot to get even the suggestion of a pill! My unsecured makeshift steek also stuck together very nicely, not unraveling at all as I fussed with it! Pulling and stretching of my Birlinn square revealed the knitted fabric generally sprung back into place. Intense pulling I was able to change the shape of the square a bit, but then very easily could work it back into shape with a pull in the opposite direction! The second time around I was quite a bit rougher with my washing, and gave it a good wring and a rub around in the sink. I blocked it without pinning on my back deck in the sunshine. The yarn held up beautifully with no sign of wear, with only a little bit more relaxation than after the first block, and it continued not to pill or look tired after I gave it a good rub against itself. I feel like I lost a little bit of softness on the second wash, but it was replaced with a smoother and more durable-feeling yarn, although it still felt more soft than crisp to me. This is an incredibly durable yarn, and it remained bouncy and stretchy after the second wash, with a barely noticeable difference from the first time around in terms of wear—still soft, warm, and thick. For the second block/wear, I was more robust with it after giving it a longer soak. I rubbed and scrunched and generally mistreated it with very little sign of pilling. The stitch definition has relaxed more but still pretty crisp in regards to the cabling and lace. Blocked back out to 9 x 6 but did notice some shrinkage after unpinning, by about half an inch on width and length. Again, very warm against the skin so somewhat noticeable to start in the heat but that just makes me think of cosy jumpers in the the winter! Completely forgot it was tucked under my bra strap until bedtime. I love this yarn and would definitely use it again. 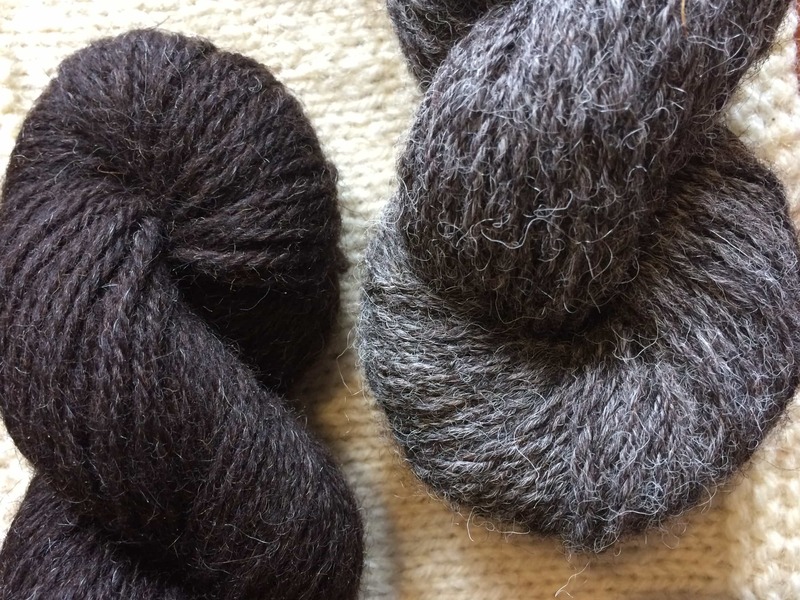 It has a lovely, sproingy woolly wool feel – I love the character and sturdiness that the Welsh Mule, Shropshire, and Sherino give to it and assume the BFL, and the fact that the Shetlands are crossed with Merino, gives a bit of extra softness to the blend. It’s a lovely true white in its undyed form and, again, I loved the subtle variations of the naturally-dyed Hagthorn color … it gives a bit of depth and interest to the color, without distracting from the pattern. Ultimately, I didn’t have problem wearing this next to the skin and can imagine a LOT of uses for this yarn. I think it’d be beautiful for warm jumpers and cardigans that would stand the test of time … and I’d be particularly excited to use it for a colorwork yoke sweater. (I was dreaming of a red ale version of Humulus in the Hagthorn dyed and natural shade I used!) I loved my Birlinn swatch and can imagine it making a gorgeous and cozy wool blanket that, again, would wear really well even with lots of use! 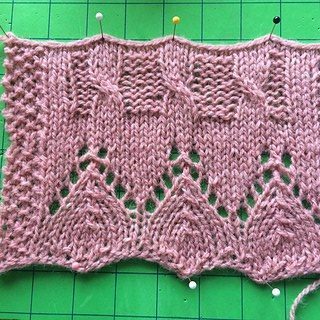 I could also imagine, using bigger needles, it working well for simple but bold lace shawls (something like Blanket Fort or Authenticity by Sylvia McFadden). And I think it’d also be great for mittens, knitted jackets, and other outerwear – it’s so warm! And since it seemed a bit on the heavier side of a DK, I also thought it could be a good British substitute for patterns calling for American worsted weight yarn … I particularly was thinking I’d like to try it as a British substitute for Brooklyn Tweed Shelter since they’re both woollen spun. I’ll definitely look forward to using this yarn again in the future! This yarn is screaming to be made into an Aran jumper. 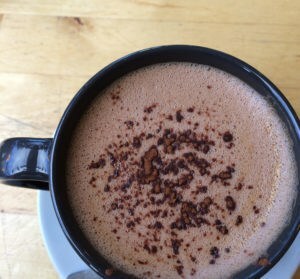 I can see myself all snuggled up in big, thick, cozy cables, enjoying a walk outside or a tea and a book, and I’d love to get a sweater quantity of it. It would also be perfect for a winter hat for the coldest days (I think it would make a lovely pom pom if that’s your thing), or a big thick cowl or shawl. 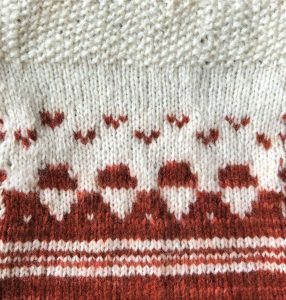 It clings together well and I would love to try some stranded colourwork in it, although it would be quite plump, and might work better as a yoked pullover or cardi than a smaller project like a hat or mitts. I would happily wear it next to my skin on my arms, neck, hands, or back, but it would be a little sensitive for me for a hat (which, strangely, is where I’m usually most sensitive). I think it might be a bit too heavy for early autumn/late spring garments, unless you’re in a really cold climate, but if you’re looking for something warm and soft that will wear like iron, this is your yarn. I was really impressed with it and am hoping to get my hands on some more in the near future! I could definitely see a nice cabled jumper or cardigan in this yarn and I think it would work very well for something with lace detailing. I’d be very tempted to knit a Incunabula in this yarn in the future. The Eglantine is a lovely dusky pink and the Speedwell is a muted blue, both with consistent colour through out. Would knit with again for sure! Recently, through wool exploration, we have found ourselves with a few breeds and yarns which we’ve generally thought of as “traditional” and “reliable” – in that the fabric reminds us of vintage sweaters and that the qualities make a long wearing item (there’s a reason many vintage sweaters were handed on, and handed down, right?). Shropshire Ply seems to be another yarn we can add to that category. Not simply long-wearing, but look at how it knits up in lace, cable and colour-work! I love the suggestions of Aran sweaters and colour-work or yoked sweaters or cardigans. Perhaps the sweater patterns of Isabel Kraemer, which often feature DK or worsted weight yarns and also encompass colourwork and lace. I personally think, with these great colours, and the plumpier DK, this would make lovely lopayesa sweaters. 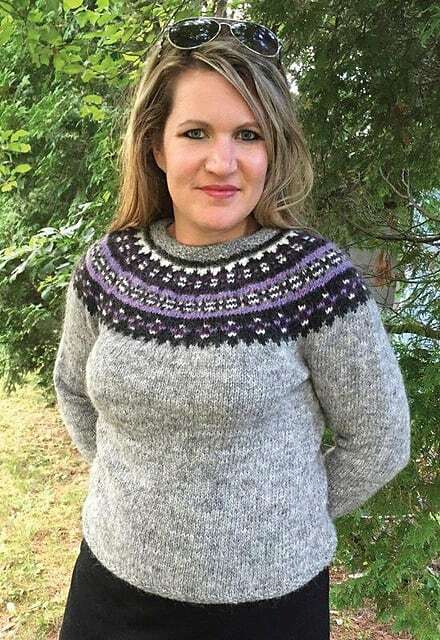 You may have to monkey with gauge and needles, but something like Aftur, by Védís Jónsdóttir would look beautiful. Once again, it is great to have more than one reviewer here, as the dimensions and opinions we get are great and really build up a bigger picture of this yarn. I am very thankful to Alice, Katherine and Meghan for taking the time to explore this yarn for us, particularly for performing wear tests in a heatwave! We are all very grateful for your exploration and your thoughts. I also have Shropshire Ply to knit up for you, but I’m afraid with house-pack-move chaos and life and work stuff, I am struggling a little to keep up with my wool exploration. Also…I may have packed this yarn! Fear not, I will swatch review and I will add my thoughts to this post when I do. 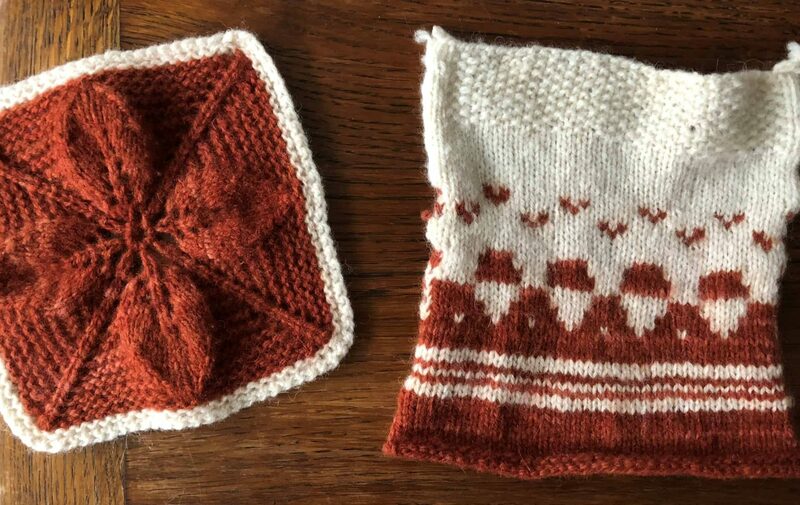 Thank you to Teri and Becca for getting in touch, for making our reviewers very happy with your lovely yarn and thank you for being such champs for British wool! 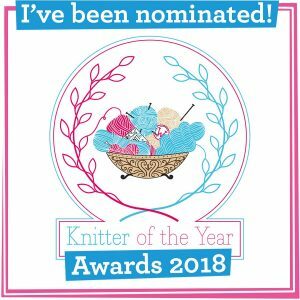 Interested in being Woolly Mucker Reviewer? There is a thread in the KnitBritish Ravelry group where you can sign up to try out yarn and review for the blog! we need to do it right over here. it’s important to show multiple dimensions of yarn and really show what it can do! 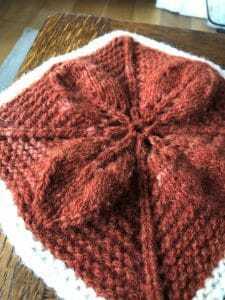 Previous PostEpisode 107 – I will never just stick to the knitting.